OAKLAND — Mayor Ron Dellums said late Tuesday he is asking state Attorney General Jerry Brown to conduct an independent probe of the police department’s handling of journalist Chauncey Bailey’s killing in August 2007. “We should have a third party look at this,” Dellums said. His remarks Tuesday came at the end of a day of meetings with police and city leaders and a day after he said it was “a no-brainer” to ask for an outside investigation. The state probe by the attorney general’s Criminal Investigations Division will “run parallel” to the ongoing police internal affairs investigation of the lead investigator in the Bailey killing, Sgt. Derwin Longmire, Dellums said. Its results would be turned over to the state investigators. It was unclear Tuesday how the parallel investigations would work. KTVU-TV Special Report: David Stevenson reports on request for state AG to look into Bailey investigation. 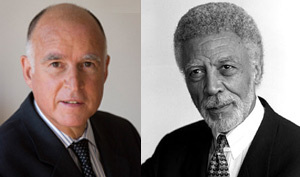 Brown, Dellums predecessor as Oakland’s mayor, could not be reached Tuesday night. Brown said Monday he would take the case if asked. “I’ll take a thorough and hard look at what we can do,” Brown said. As mayor, Brown was familiar with Your Black Muslim Bakery, an Oakland political power, but not one without deep controversy. Dellums’ request comes more than 14 months after a masked gunman shot Bailey, 57, as he walked to work at the Oakland Post newspaper. A former handyman at the defunct Oakland bakery, Devaughndre Broussard, is the only person charged in the killing of Bailey, who was working on a story about the bakery’s bankruptcy filing and internal strife. The Chauncey Bailey Project reported Sunday and Monday that Longmire, the lead detective on the Bailey case, failed to document in his notes evidence that linked the bakery’s leader, Yusuf Bey IV, to the slaying. That evidence includes a tracking device that shows Bey IV stalked Bailey seven hours before the killing. Longmire’s case notes do not document any analysis of Bey IV’s cell phone records, which were obtained with a warrant. The Bailey Project analyzed those records and found Bey IV was on the phone with an acquaintance of Bailey’s as he stalked the reporter. They also show a series of calls within minutes of the killing. To read stories on that evidence, go to www.chaunceybaileyproject.org. Dellums told reporters outside his office Tuesday that he did not want Longmire to have anything to do with the Bailey case. “I don’t think he’s on there right now,” Dellums said of Longmire, but said he didn’t know the detective’s status. Assistant Police Chief Howard Jordan wouldn’t answer questions about Longmire’s status as he left a meeting with Dellums. The Alameda County District Attorney’s Office is conducting a separate investigation of Bailey’s killing, taking the unusual step of assigning two investigators to it and letting them work independently of Oakland police. Those investigators are working with evidence Longmire didn’t analyze in an attempt to determine if others should be charged in Bailey’s killing, law enforcement sources said. Dellums, a former member of the U.S. House of Representatives, said he first thought about asking for a federal investigation but backed away from that idea. “Trying to find a way to the federal government isn’t easy,” he said. City Council President Ignacio de la Fuente, Dellums’ mayoral opponent in 2006, said he stood behind the request for the independent investigation. Dellums said he encountered “no push-back” within the police department for the investigation. But homicide unit commander Lt. Ersie Joyner, speaking briefly with a reporter Tuesday, said he “stands 100 percent behind this case” and investigations of Longmire will result in nothing. Thomas Peele is an investigative reporter for Bay Area News Group-East Bay. Bob Butler and Mary Fricker are independent journalists. Reach them at tpeele@bayareanewsgroup.com, bobbutler7@comcast.net, and maryfricker@hughes.net.